In our current economic climate we are all looking to make positive changes to the way we live financially. At the same time the pressing topic of climate change means that we also need to make environmental changes, and heating is one of the priorities. Across the country bricked up fireplaces are being opened up and stoves installed to bring some welcome warmth into the home which is why firewood is in increasing demand. Q. What made you get into wood fuel supply? A. Using logs and briquettes ourselves we noticed a vast difference in the quality of products being supplied. We noticed more and people opening up old fireplaces and installing wood burners in an effort to reduce their energy bills. We wanted to supply a consistent good quality product and I think we have achieved that. Q. Why do you think that UK forestry businesses have not yet really cottoned on to supply of firewood - do you think that the price is not right yet? A. Generally the better quality wood is utilised in the furniture and construction industries leaving very little good quality timber for firewood production. A lot of the time the cost of producing the firewood on a commercial scale is just too high for most to bother with. We found that later in the season that seasoned wood is unavailable due to high demand resulting in the market being flooded with green timber. before putting them in my stove. As well as seasoned firewood they also supply sawdust briquettes. Q. Where does the sawdust come from? A. The saw dust is a bi product of furniture manufacturing, and can be delivered in single 20kg boxes or multiples thereof. Q. Are they proving popular? A. 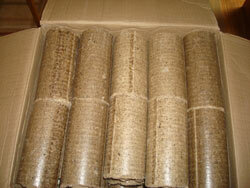 We have been overwhelmed by interest in these briquettes. Q. Do you have a stove at home, or anyone else in the company? I guess you/they use your briquettes and logs on it? How do you find the briquettes compared to logs? A. We do use both logs and briquettes at home. We find the briquettes on there own burn too hot so use them in combination with logs. This also helps spread the cost of using briquettes. I am not sure of the calorific value of coal but the briquettes seem to burn just as hot. This confirms some of the things which I already know about firewood. Last year the market did get flooded with firewood which was not well seasoned. It is dangerous to burn unseasoned firewood because you get a huge increase in tar deposits in the chimney which increases your risk of chimney fire. The more instantly apparent difference though is that the wood is hard to light, gives out little if any heat, blackens up the stove window straight away, and then right near the end of the burning cycle, when the wood has been dried under its own heat, the stove can get far too hot because of course you have to leave the air vents fully open to even get it to stay alight. This is frustrating to the customer and their first thought is of course that there is something wrong with the stove because the firewood is definitely seasoned because the supplier said it was. Firewood is not firewood until it is well seasoned - until then it is chopped wood that will one day become firewood if allowed to dry. My advice is to have a two part approach. Secure some firewood which you know is guaranteed to be very well seasoned, or some dry briquettes, from a supplier like Mainland Aggregates. Keep this supplier in your back pockets as there will always be times when you do need to order in some wood. Then buy in chopped wood (or even better felled timber by the tonne) at a cheap rate and season it yourself - this can take 1-2 years depending on the wood. This only works of course if you have the storage space. If you do not have the space then do make sure that you obtain a firewood moisture meter - when the firewood supplier comes with his load take a couple of logs, split them, then test the split face with your moisture meter. The logs should be 20% or under - I am burning wood which I have felled, sawn, chopped, and seasoned which is at around 17% and I think I could get that down a bit further. Above 25% moisture is too wet, and if all the logs are like that then you are getting ripped off is if the supplier claims they are seasoned, because they are obviously not. Mainland Aggregates have a website, where you can buy firewood online.